I recently visited Sunnylands, a historic residence located on the desert at Rancho Mirage, CA, with my family. Completed in 1966, this residence belonged to the late philanthropist and billionaire publisher, Walter Anneberg. Apparently he had always dreamed of living in a house surrounded by golf course and he realized his dream when Sunnylands was built. Sunnylands takes up 200 acres with a 25,000-square-foot house. Without advanced ticket purchase, you will be stuck at the visitor center with the others. With our tickets in hand, we traveled in a golf cart toward the residence. The view was breathtaking everywhere you turn. Coming up the winding driveway that was once traveled by Queen Elizabeth II, President Reagan, Frank Sinatra, and many others famous icons and royalties, we were greeted by the Birds of Welcome. Surrounded by mountain ranges and man made lakes, A Quincy Jones and William Haines designed a spectacular residence. The view from every angle befits a postcard. As we approach, I was taken away by the modernist architecture and the statement roof. It was a bold approach at modern architecture sporting exposed beams and ceilings that worked seamlessly with the surrounding. Photos were prohibited inside the residence for security reasons since the estate still hosts high profile retreats such as the recent one with President Obama and President Xi Jing Ping. One of my favorite parts of the residence was the guest rooms. In each of the color-themed bedrooms, the Annebergs ordered special pillows displaying quirky phrases like “great people don’t make long visits” and “you are ready to leave on Sunday, right?” Totally enjoying Mr. Anneberg’s humor. Another favorite is Anneberg’s wall of Christmas cards from Queen Elizabeth II. Mr. Anneberg apparently wrote to Queen Elizabeth II every year near Christmas to let her know how much he enjoyed receiving her Christmas cards so that she would send one that year. This is just one of the many many views that are superbly gorgeous. Below is a art-piece, a free-standing work of metal rods that is arranged to provoke dynamic nature, dubbed the Peacock. It is not clear who named it The Peacock, but it’s an absolutely handsome piece connecting the residence from the game room. I could spend hours just walking on the lawn, but alas, the tour ends after 90 minutes. And we were shipped back to the visitor center. You could watch a short movie introducing the Anneberg historic residence and visit the gift shop, but take my words, plan ahead and purchase a ticket for the tour in advance. You will not regret it. Here’s an interesting fixture I found at the gardens – the bench. 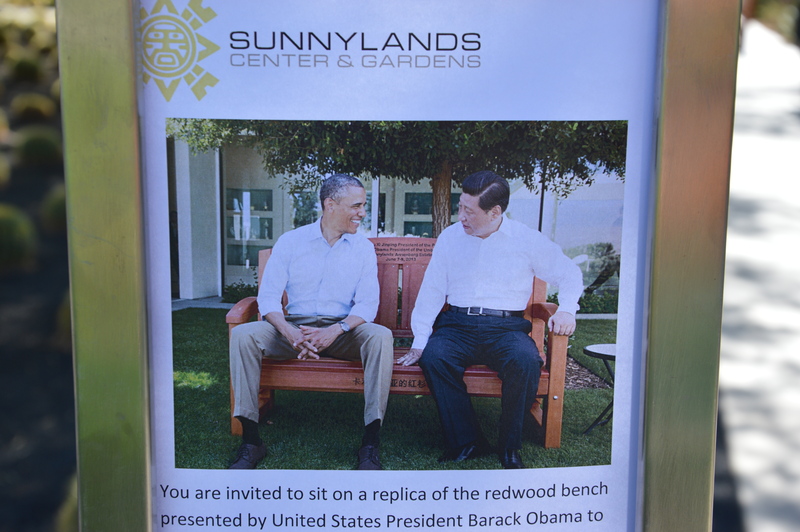 It’s not just any bench, it’s a replica of the redwood bench presented by President Obama to President Xi Jing Ping during his visit and you can sit on it and pose, if that’s something you are interested in. This is definitely a place worth your visit. This link is where you make your purchase. It is $35 per person and released in half-month blocks on the first and fifteenth of every month meaning if you like to visit Sunnylands on January 16, in the Jan 16-31 block, you need to be ready on Jan 1 9am PST at the link to make your purchase. And for visits between Feb 1-15, you need to be ready on Jan 15. The tickets run out as soon as they go on sale. If you have a party of 2 or more, you need to be the first to grab your time block. The tour are scheduled every 15 minutes from 9:15 to 10:15 a.m., 11:00 a.m. to 12:00 p.m., and 1:30 to 2:30 p.m, so be smart and be fast. You do need to register to purchase the ticket, so I recommend signing up for an account in advance. The tickets are nonrefundable, so be smart and visit Sunnylands. If you didn’t have a ticket, you’ll be looking at this view and wishing you did advanced planning.